I went from Primefaces 6.2.2 and Extensions 6.2.2 to 7.0RC1 on both. Apollo has remained at 2.0.2 the whole time. This is having to do with the ApolloMenu. After I log in is when the menu should render, and that's when I'm getting the error. 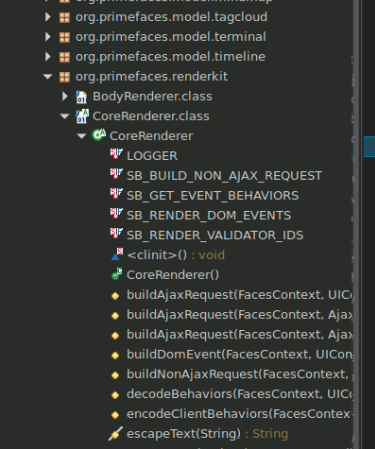 I looked in the PF 7.0RC1 jar that is listen in eclipse under maven dependencies and located the method in the CoreRender class. No, after 7.0.Final, we'll update all Premium Layouts. I appreciate you providing fast support. You're the best! I will hold off migration till then..
By the way, do you know when roughly 7.0 Final will be released? We'll release 7.0.RC3 in this week. Maybe, 7.0.Final at the end of this month. I assume the new version for Primefaces 7.0 is Apollo 3.0 (it's the newest in the migration guide) ? Fixed now, please try again.